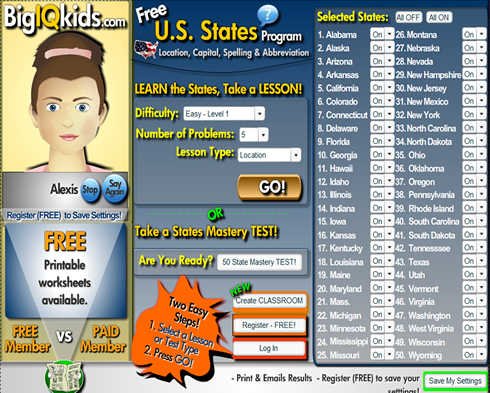 Does your child know the 50 U.S. States to mastery? What is the capital of Michigan? Where on the map is Wyoming? What is the US Postal Service abbreviation for Missouri? Which state is known as 'The Land of Enchantment'? If not, chances are they WILL be required to know the 50 states cold by the time they reach 6th Grade. In order to prepare for this required subject matter, BigIQkids U.S. States Program was created. This leading edge application will engage your young learner via interactive lessons and quizzes with the goal of achieving mastery of all 50 states’ locations, their capital cities, correct spelling and associated abbreviations. TRY IT ... TODAY! IT'S FREE!